On January 20th, 2019, there was a full lunar eclipse, which caused a Super Blood Moon. 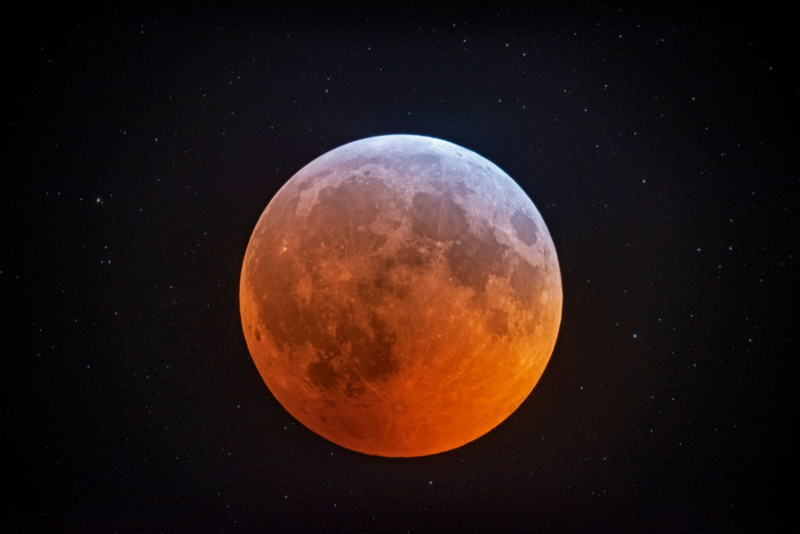 Super Blood Moons cause the moon to appear red or a dusty brown. This was the last full lunar eclipse until May 26, 2021 that will be visible from North America. A Super Blood Moon occurs because as you probably know, the moon does not produce its own light, it gets light from the sun. Blood Moons happen when the Earth moves in between the Sun and Moon, so only some light gets to the moon. This makes it red. At 9:36, the penumbral eclipse began. This means that a corner of the moon is black. This is hardly visible. At 10:33, the partial eclipse started. Over the course of about an hour, the moon slowly turned black and was entirely covered. Then, at 11:41, the moon began turning red. This is called the full eclipse. At 12:12, the maximum eclipse began. This is when the moon is the most red. Then, the moon went through this process backwards, and at 2:48, the moon moved out of the Earth’s shadow, and the eclipse was over. I was only able to see the eclipse from my house until about 11:30 because the moon is still moving. I watched a NASA live stream, though, and it looked really cool! I can’t wait for the next one!